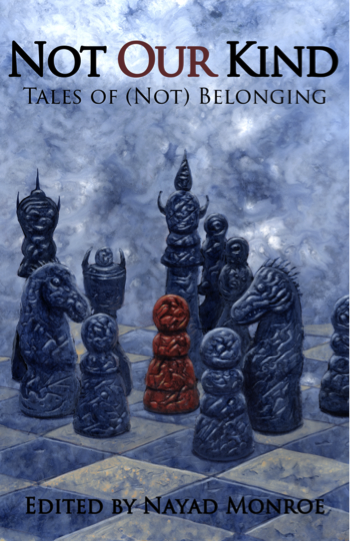 I’m excited to announce that my story, “Euryale Rising,” will be appearing in Not Our Kind: Tales of (Not) Belonging, forthcoming from editor Nayad Monroe and publisher Alliteration Ink, Kickstarting now. I had great fun writing this piece. It takes place in the southern Alberta countryside, and features real landmarks and sights from my day trip to the Millarville Farmer’s Market last fall. Euryale is one of three gorgons in Greek mythology, second eldest of the dreadful, brass-handed creatures and known for her bellowing cries. Orv is loosely based on my own grandpa (who’s named neither Ambrose nor Orv), a former farmer and adorable and lively man who turned 100 (!) this year. I dedicate this story to him and to my equally wonderful grandma.